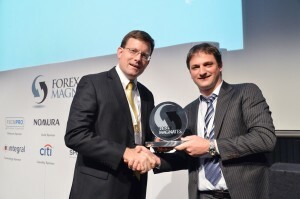 London: Forex Magnates is pleased to announce that Oanda has been awarded the Best FX Broker at the prestigious Forex Magnates Awards which took place in the world’s financial capital on the 14th of November 2012 at the Grange Hotel in St Paul’s. The awards took place at the inaugural Forex Magnates Summit which was attended by over 500 influential players in the FX and derivatives trading space. The one day event commenced with the New Financial Trends Panel and panellists included CEO’s of the world’s largest financial and technology firms. The event was the first of its kind as senior members of the retail and institutional FX markets were brought together under one roof. Courtney Gibson, Vice President of Trading at OANDA received the award from Michael Greenberg Founder and CEO of Forex Magnates. 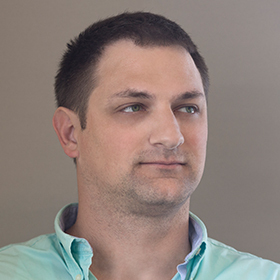 Courtney Gibson, Vice President of Trading at OANDA and Michael Greenberg Founder and CEO of Forex Magnates. Oanda’s Vice President of Trading, Courtney Gibson spoke about the awards, he says; “We are thrilled to be recognised by our industry partners for our forex technology leadership and our reputation for excellence in client service. OANDA was an early innovator in the forex space and helped open the market to retail clients with one of the first fully automated online trading platforms”. Forex Magnates is a specialized forex news source and trading research firm. News source: Forex Magnates has been on the forefront of forex breaking news publishing since early 2009. Forex Magnates is the go to source for most of the retail and institutional forex industry leaders and market participants who would like to see the latest breaking news and receive an in-depth analysis of latest events. Quarterly report: Since Q1 2011 Forex Magnates publishes a quarterly retail forex report over-viewing latest market trends, trading volumes and developments in various regions. The quarterly report is used by hundreds of forex brokers, banks, investment firms and others to gather the most accurate overview of the otherwise little researched industry. Research: Forex Magnates performs specialized ad-hoc research as required by clients in various branches of the financial industry. Forex Magnates utilizes its network of hundreds of market participants to conduct the most thorough and detailed reports possible. Lately the Forex Magnates Research team has performed various research reports from detailed mapping of the forex market in little known regions through overview of the latest financial technology trends and available options to global CFD market overview and forecast. By the way, it seems like Oanda quietly shut down their Dubai/Middle-East presence. The .ae website is gone, so are the links from the main website, and they withdrew their DFSA registration. i think this one looks much better graphically, but doesn’t show the pip levels like Saxo’s right? I’d imagine the biometric data is encrypted, like a password. Even if not encrypted, a hacker has no way of emulating the digitized data into physical form. If the machine can theoretically be hacked by injecting only the digitized data, it should be elementary to disable approval unless the physical route is taken.